Offensive inconsistency has become as much a part of the team’s identity as defensive proficiency under coach Doug Marrone. It’s Jacksonville’s biggest downfall and a main reason why many outsiders refuse to consider the Jaguars (2-1) a legitimate title contender in 2018. They reached another low Sunday, failing to score an offensive touchdown for the second time in two years, advancing past midfield just twice and losing 9-6 to AFC South rival Tennessee . Dropped passes, batted balls and penalties were part of the problem. So was Blake Bortles, who completed 21 of 34 passes for 155 yards and was sacked three times. The lackluster performance came one week after Jacksonville looked unbelievably smooth in a 31-20 victory against New England , a rematch of last season’s AFC championship game. The Jaguars will try to bounce back against the New York Jets (1-2) on Sunday, wrapping up a three-game homestand. “We’ve got to find out and figure out how we’re going to handle it as a team,” Bortles said. Getting running back Leonard Fournette back would help. Fournette missed his second consecutive game with a strained right hamstring. He tweaked it in the season opener at the New York Giants and has missed 10 of 12 quarters. Fournette is the team’s offensive centerpiece, a pounding runner who sets the tone for Marrone’s throwback style. The Jags managed to beat the Giants and Patriots without him, but needed a defensive touchdown to upend New York and the best game of Bortles’ five-year career to knock off New England. They never led against the Titans, falling behind after a failed fake punt early and giving up a game-winning drive late. It was the franchise’s fewest points since a 30-6 loss to Houston in the 2015 season finale and its fewest at home since a 37-3 drubbing by Indianapolis in 2013. The Jaguars blamed the latest dud on matchup issues against the equally physical Titans, who have won three in a row and five of the last six in the series. But they also struggled to generate many yards and points against the Jets, Cleveland, Arizona and Buffalo in 2017 and against the Giants two weeks ago. 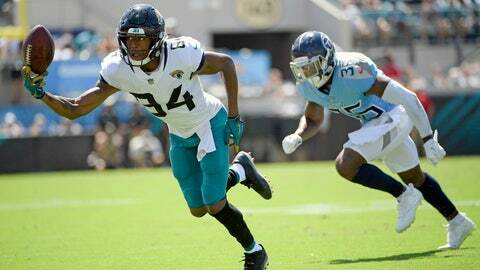 “Very frustrating, but we’re not going to blame people,” Jaguars cornerback Jalen Ramsey said. Not yet anyway. But in a season several players have dubbed Super Bowl-or-bust and with a defense that considers itself the best in the league , Jacksonville has potential for back-biting and finger-pointing. The Jaguars insist that won’t happen. Several defenders even spoke in the locker room after the loss and showed support for Bortles and the offense.